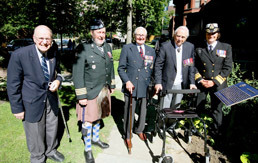 Rear Admiral Bennett, Captain Larke, Professor Desloges, representatives of the Soldiers’ Tower Committee and the Ontario Heritage Trust, ladies and gentlemen. Thank you for joining us at Woodsworth College today. I am honoured to represent the University of Toronto community on this occasion. On this date in 1939, Canada declared war on Nazi Germany. Over the course of the war, more than one million Canadians served alongside our allies in the causes of freedom and social justice. Many faculty, staff, students, and graduates of this university served with distinction among them. 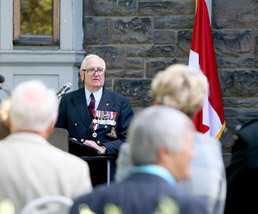 By 1945, more than 45,000 Canadians had made the ultimate sacrifice. 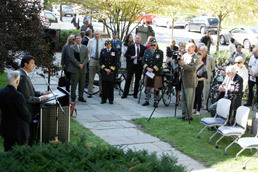 Among the fallen were 557 of our students and graduates, whose memory is honoured at the Soldiers’ Tower. And today we honour a very important part of this history, and an era in the life of the University of Toronto. Since 1974, 119 St. George Street has been the home of Woodsworth College. Its significance in the decades before that has been largely unknown to generations of students – and, I expect, to most other members of the community. The plaque to be unveiled today will help make known the prior history of this place. And it will also provide a source of inspiration, a reminder of the foresight and dedication of an earlier generation. 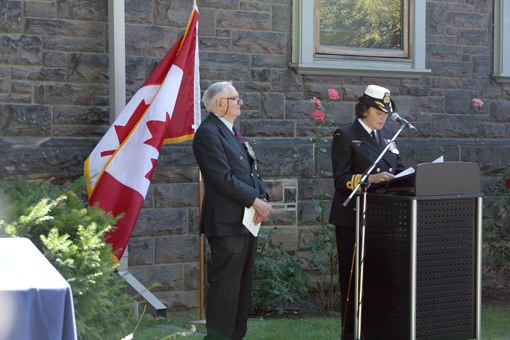 From 1939 to 1968, this house and the former Drill Hall formed the headquarters and training facilities of the University of Toronto Contingent, Canadian Officers Training Corps. The University’s Board of Governors, as it was then called, purchased the house for the Contingent’s use. At the same time the Contingent paid for the construction of the Drill Hall, using funds accumulated in the inter-war period through members’ signing over their pay. As a result, when war was declared, the University Contingent was, for the first time in its history, housed in adequate, dedicated facilities. And, beginning in those crucial years and extending across three decades, thousands of students and graduates trained here for service at home and abroad. University buildings exist for the education and formation of leaders. We see that reality today, as the students of this great College prepare to take on the world, and to make a better future. But, as the plaque soon to be unveiled will forever remind us, this site once served to prepare students for leadership in a very different time. Through their service, they helped to make our future possible. It is well known that J.S. Woodsworth, for whom this College is named, was a pacifist who opposed Canada’s entry into both world wars – not a popular decision for a prominent politician. Many in the House of Commons signalled their respect for his courage and his position even as they disagreed vehemently with it. In that sense, they upheld a tradition of respect for dissent that is at the heart of both democracy and universities. COTC, meanwhile, is long gone from our campuses. Now, in this troubled world, universities are thinking hard about the nature of our interaction with Canada’s military. For example, some citizens are asking whether students might again be given the opportunity to participate in a different form of military training – one geared to our peace-keeping traditions. The program is described not in terms of officer training, but, more appropriately, as a Canadian National Leadership Program – and I know many here today will be familiar with this effort. Some, like J.S. Woodsworth, may be critical of the very idea. I will simply say that, just as we honour those who served, those who fell, and those who dissented, so also might we respect the freedom of our students to choose to participate in such a program – or to criticize it vocally. That freedom to choose, after all, is built on the spirit of service of our COTC contingent. I am proud that such a spirit of service endures here among the students, staff and faculty of Woodsworth, who in their own ways, are doing so much to make this a better world. 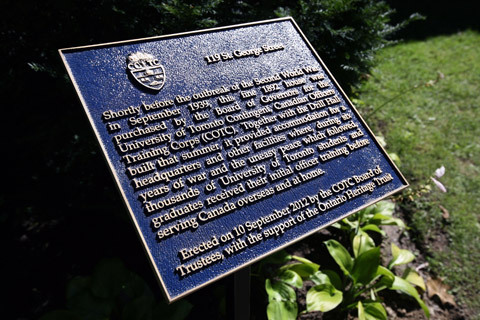 In closing, let me say that I am gratified to see the history of the University of Toronto Contingent COTC recognized and made better known through the erecting of this plaque. On behalf of the University community, I offer my thanks and congratulations to all those responsible for today’s milestone. Canada overseas and at home. support of the Ontario Heritage Trust. 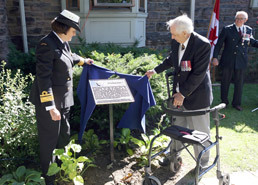 Rear Admiral JJ Bennett of the Royal Canadian Navy, along with Captain John Larke, former cadet and contingent officer (COTC), unveil the newly-dedicated plaque on the morning of September 10, 2012. 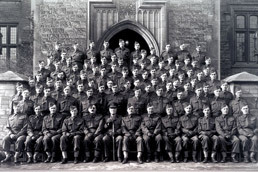 Training staff of the COTC in front of Hart House for a photograph in March of 1942.